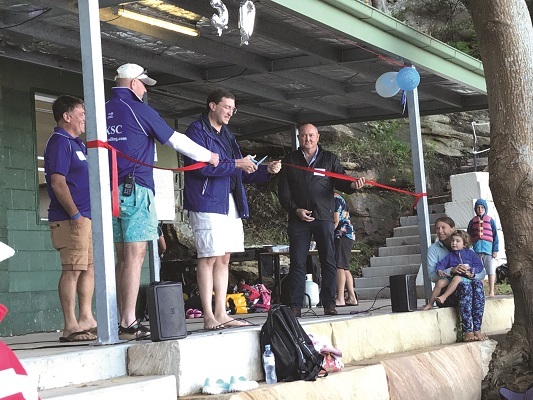 The Hornsby Ku-Ring-Gai Sailing Club (HKSC) celebrated its 50th Anniversary season with an afternoon beach party at its waterfront clubhouse near Brooklyn on Saturday. With over 1000 young people having passed through the Club’s training and development program over five decades, the opportunity to gather for a catch up was always going to be special. Two hundred guests of all ages gathered as Julian Leeser MP opened the building extension funded under a grant from the Stronger Communities Program. In a moving speech, club Commodore David Downey thanked parent organisation Police Community Youth Clubs (PCYC), members, helpers and supporters past and present, and made a special presentation to the Brown family who have mentored generations of junior sailors and guided the Club to this remarkable milestone. Accepting a memorial plaque on their behalf, recently retired Commodore Graham Brown paid tribute to his father and HKSC founder, the late Jim Brown. “It makes me incredibly proud – as it would my father – to look out over this group of terrific people, at this beautiful view that inspired Dad and his mates fifty years ago, and know that next summer and the one after that, a new group of youngsters will take to the Hawkesbury and feel the thrill of sailing for the first time”. The Hornsby Ku-Ring-Gai Sailing Club will open its 51st season in September, and welcomes enquiries for Learn to Sail and youth racing programs.